Safe, Educational, Family Fun! Come play with us and make some memories here on the farm! - You can walk through the corn maze and to the pumpkin patch any daylight hour from now till Halloween! Wagon rides are weekdays 4-dusk and Saturdays 10-dusk. Night Walks available every night as well! Bring a flashlight, bundle up, and text Wendy that you're on your way! 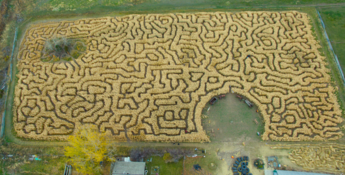 Test your wits in the educational corn maze, play farm games with treats, get your face painted, see the tractors, and pick out a pumpkin from the 15 acre patch. Concession stand! Sweet Corn Meal: Try our famous Sweet Corn with some spud chips, and drinks--oh, and don't forget all those homemade Fall themed delights! Yum! **After Hours available!~ Dates, Groups, families, or classes are welcome to come other times too! Just call Wendy to schedule 705-0991. We'll open for you! SEPTEMBER 29th!- Opening day! Be the first through the maze and into the pumpkin patch! October 13th: Try your hand at spray paint art as our professional spray paint artist teaches you and the kids the tricks of the trade. Make your own work of art to keep! Cost is $5 for materials. October 20th - FREE Pumpkin Decorating contest! We provide the materials, while you get creative and decorate your pumpkin! Cash prizes for the winner! October 20th DATE NIGHT! 7-9pm $15 per couple for a wagon ride, hot cider, and the maze. Dress warm and bring a flashlight. October 27th Costume Contest with prizes- We'll have a lot of fun walking the catwalk on this one! Cash & pumpkin prizes for the winners! *We will gather all costumed kids to walk the strawbale catwalk at 1pm please be on time as we will not wait for late comers this year. Prizes will be awarded around 2pm! 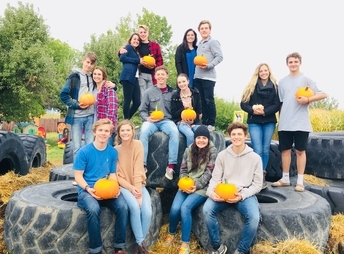 HALLOWEEN DAY: 4pm-8pm (bring flashlights for after dark) No farm fair, just the maze & pumpkins this day, but group discounts apply to everyone! New, bigger wheat sandbox! The popular wheat sandbox has grown up this year and quadrupled in size. Strollers & Wheelchair: All terrain strollers/wheelchair can make it through the maze fine, but small wheeled strollers may struggle. Also, motorized wheelchair with fat tires navigate far better than fold up, traditional wheelchair. Some of our fun attractions: Hay Wagon ride, Face Painting, Tiny Tot straw Maze, Straw Slides, String Maze, Blonde Maze, Corn Maze, Wheat Pool, Puppet station, Little Tikes toys/kitchens/houses, Face Painting, Ring Toss, Pumpkin Bowling, Bean Toss, Story Time, and more! October 20th from 7-9pm is Date Night! Grab your sweetheart and come to Date Night! For just $15 a couple, you and your honey can snuggle under the quilts on a hayride under the stars, wander through the maze with your flashlights, and sip hot cider or cocoa! Also, dinner and other concessions will be available for you if you need a bigger snack. We hope to see you soon! *Infants 1 & under are free. **Veteran card holders are free. Bring your card! Thank you! **Child cancer survivors are free. * Haywagon rides are available for only $1 per person. NIGHT WALK Through the Corn! What to bring: Flashlights and warm clothes. What to expect: It will take a little longer to find your way out in the dark, but 35-45 minutes is average. 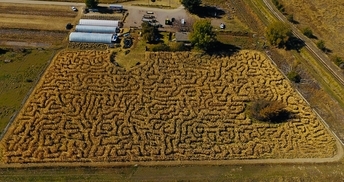 Local news station 3 did a story on our Corn Maze a few years ago. You can see it by clicking on the link above. It is bigger and better this year though!